Some of the most popular party themes come from television shows – especially children’s shows. 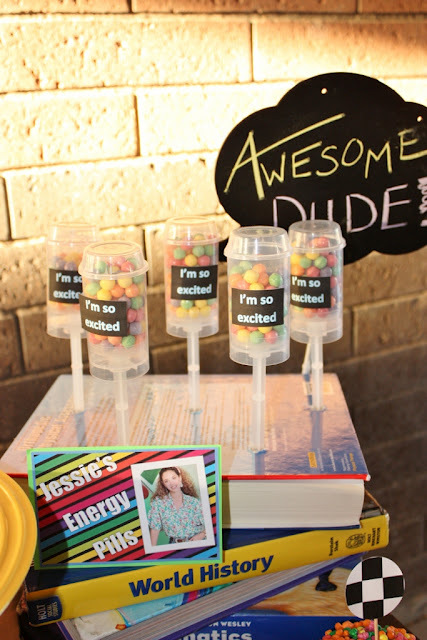 This week we are featuring party inspiration from some popular shows on the tube. In the past few years, SpongeBob SquarePants has become a very popular children’s television character. Even though some parents may not love this under the sea adventurer – he sure is a hit with the kids. 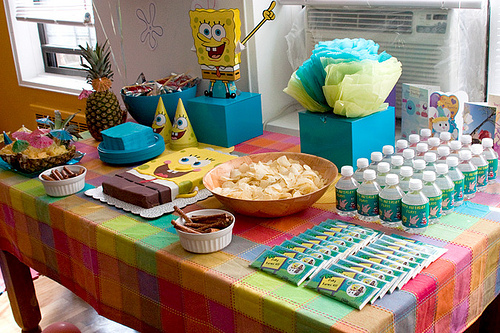 If you are thinking of planning a “Bikini Bottom” birthday for your child, you can start with some inspiration from this SpongeBob Party featured on Total City Girl. 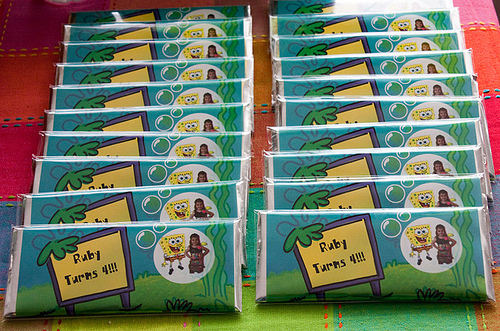 This party is adorable, with tons of SpongeBob printables that are fabulous. 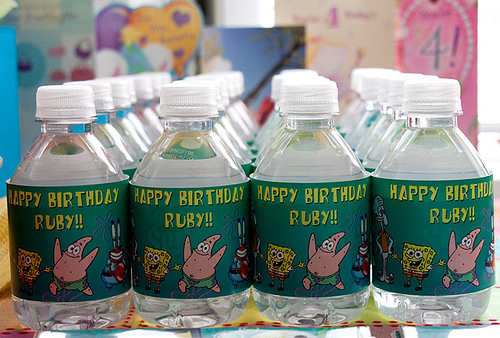 The personalized chocolate bar wrappers and water bottles labels are really nice and are a great way to make the birthday girl (or boy) feel extra special. The most impressive part of this party is the cake. 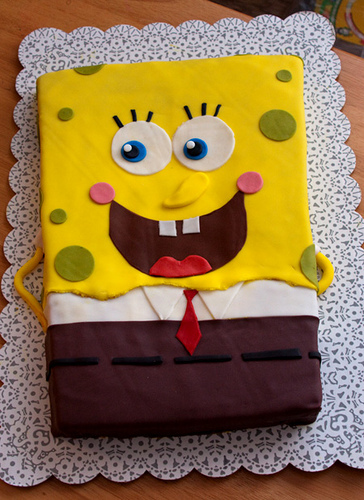 It looks exactly like SpongeBob – and is a great focal point for the party table. 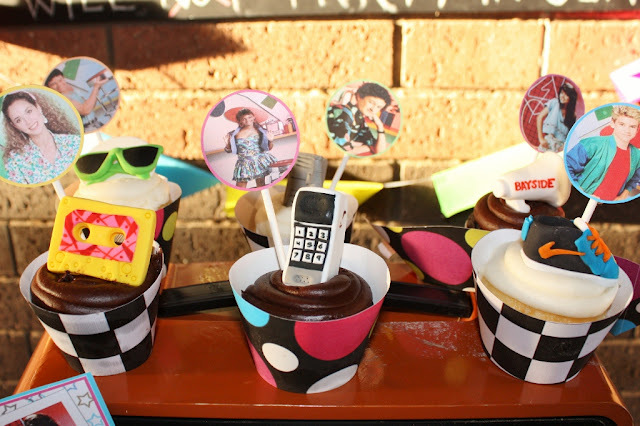 Delicious cupcakes were also served and the kids decorated them with their favorite toppings. What a yummy idea and fun activity! I think it’s safe to say that most little girls go through a Dora the Explorer phase at one point in their life. Dora (and her friend Boots) have quickly become a party theme favorite for many of the little misses out there. We found this Dora Party from Creating Couture Parties and it is absolutely delightful with everything Dora! 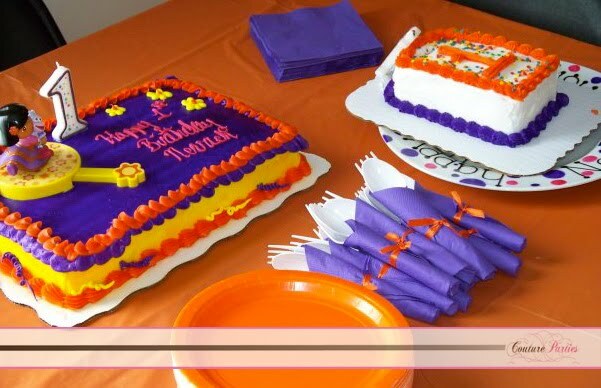 The party decorations and styling is all done in orange and purple – the colors of Dora’s favorite (well, maybe only) outfit. 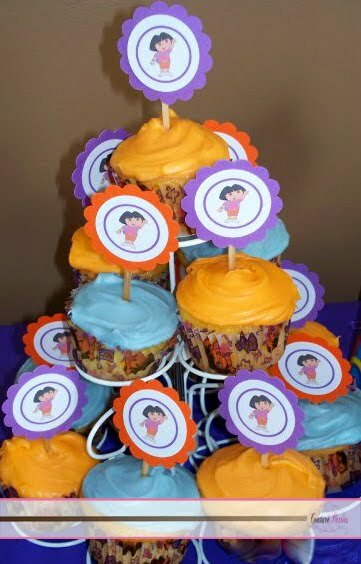 Cute party printables like a custom birthday banner, cupcake toppers and favor bags/tags help bring this Dora party to life. I like the cute, and inexpensive idea of adding Dora stickers to plastic cups to make them more festive. 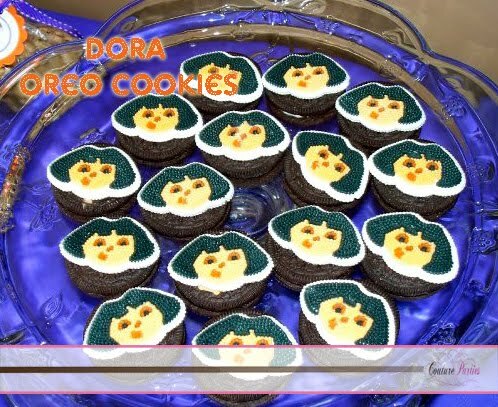 The Dora Oreo cookie treats are great and it's a cute touch having Dora’s smiling face on them. If you are planning to host your own Dora party, you may want to consider hiring a Dora costumed character to surprise your daughter on her special day. In the 90’s I grew up watching Saved by the Bell, and if I’m honest – I still sneak a peek at reruns when they are on at random times. 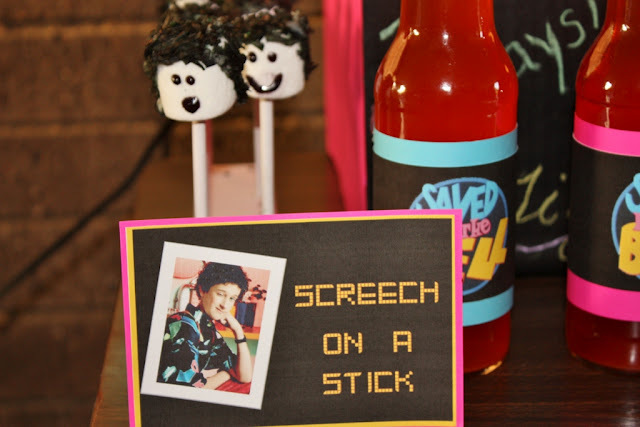 So, when I saw this Saved by the Bell Party from Kara’s Party Ideas I felt I owed it to my generation to share the details. This party is totally creative and includes so many great references to the show. 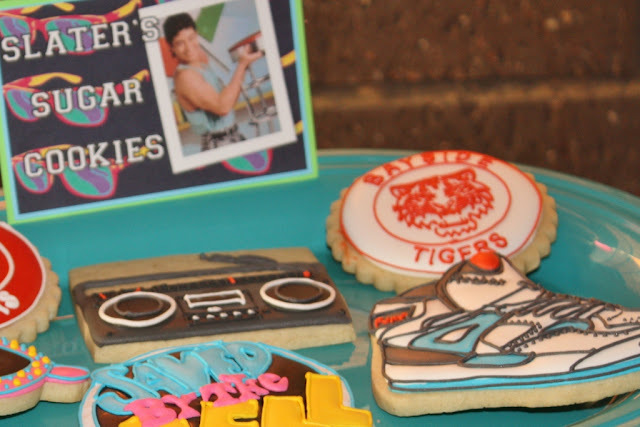 Everything is extremely colorful, just like 90’s and there are tons of tasty treats like “Slater’s Sugar Cookies,” “Screech on a Stick,” and “The Max Burgers.” The sugar cookies are quite detailed and were made in various designs, including the Bayside Tigers logo, sunglasses and high tops (all things you see in the opening credits of the show). The cupcake toppers with pictures of the characters from the show are great. This is a really fun party for those of us that grew up with Zack Morris and the gang – it really makes you (well, at least me) nostalgic. For more party inspiration, you can visit our event planning pages. You’ll find tons of party ideas and resources, as well as fabulous event entertainment suggestions. What do you think of today’s featured parties? Let us know in the comments below.